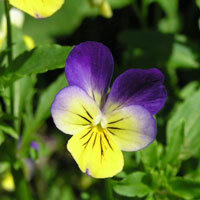 Viola tricolor is a European wildflower commonly known as Heartsease or the Heart’s Ease Herb. As its name implies, the Heartsease has a history of use in herbal medicine centuries old. Heartsease purifies the bloodstream, stimulates healthy urine production and most commonly, improves skin condition.